How can mosquitoes be prevented? With a wet summer, mosquitoes are a major problem. Their painful bites and the deadly diseases they transmit including the West Nile virus, malaria, encephalitis, dengue fever, plague, chickungunya, and zika are well known. For more information visit the Center for Disease Control. Pets are at risk for the West Nile virus and also for the canine heartworm carried by mosquitoes. There are solutions. You can minimize the mosquito breeding areas around your home to keep you safe from mosquitoes. The first goal of this health issue is to eliminate any standing water around your home. This may mean correcting poor drainage areas around your home's foundation. Check for standing water and consider removing tire swings, wading pool, flower pots, urns, pool covers, ornamental fountains, toys, pet bowls, empty bottles, cans in the recycle bin, open garbage cans, open top of basketball goals, a wheel barrow and all other debris and containers that could hold any water. Fill in tree holes, clean roof gutters thoroughly, eliminate over watered landscaping, and check landscaping for areas that hold water and drain slowly. Involve neighbors as well. Chances are there are breeding grounds around their homes too. Mosquitoes breed in standing water where the adults lay their eggs and the larvae hatch and develop in four to five days. Because they must have water to complete their life cycle, removing and/or treating the sources of standing water is the most important tool in their control. Since mosquitoes stay close to the area where they developed into adults, the standing water is probably nearby when you see the mosquitoes. 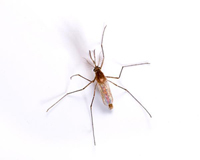 The mosquito season is considered to be from March through October or as soon as the temperature is above 60 degrees. The season extends into November and December when the weather is warmer. Treatment includes adding granules for exterior protection as well as briquettes for use in water retention areas. Airborne chemicals also kill adult, active mosquitoes. You can add extra protection from mosquitoes by using insect repellent containing DEET in concentrations up to 35% to any exposed skin when you are outdoors. Wear light-colored clothing and long-sleeved shirts and long pants while outdoors. Since mosquitoes are most active from dusk to dawn, take particular care during these times. Installing and/or repairing screens can also prevent their entry into your home. Mesh should be at least 18 x 18 strands per square inch or finer to keep out mosquitoes. Consider caulking and sealing other entry points. Encouraging pest-eating birds or fish can also aid in mosquito control. Dogs and cats need protection from mosquitoes. Mosquitoes transmit heartworms, equine encephalitis, and other animal diseases. Follow the advice above and consult your veterinarian. Mosquito-borne diseases and parasites can be fatal or irreversible. Mosquitoes and the diseases associated with them were once relegated to a minor status, thanks to people like Fredrick Stoepel who led a relentless worldwide campaign to eradicate mosquitoes from the 1930s until the 1960s. As I begin my 35th year as a pest management professional, I receive more questions about controlling mosquitoes than any other pest. They have become the dominant media pest as well. I advise consumers to follow these suggestions as well as involve your community and Enviroguard pest management professionals who can assist in identifying breeding sites and recommend control strategies. At our lake house, where we open and close our door many times during the day, we are pestered by flies and mosquitoes. How can we control them? Around water areas, flying insects are a nuisance. Control is a challenge and the goal is population reduction rather than elimination. Lights near entry doors are attracting these flying insects. Flies are seeking food and mosquitoes are seeking humans or pets for a blood meal. These pests can carry disease and control is very important. Make sure doors close properly without visible cracks. Install door sweeps at the bottom to seal any openings. Move lights away from doors or use different types of lighting (yellow bulbs, for example are less attractive) and consider mounting these lights in the yard. Bug lights or bug zappers can help the problem, but if they are installed near or just outside the door, they can attract additional flying pest. For best results, these bug lights and bug zappers should be moved away from your entry doors. They should never be used near food preparation areas. Circulating air also repels these pests. Have you ever felt the forced air curtain above your head when you enter a fast food restaurant or convenience store? These are non-chemical control measures and flying insects will not enter the forced air. You can do the same thing with an inexpensive floor fan inside your entryway pointed toward your door. Use the highest fan speed and angle the flow from four and six feet wide. Move trash cans away from entrances and ensure all food spills are cleaned quickly. If these measures are not enough, Enviroguard pest management professionals can develop an effective population reduction program.